I read a LOT of Holocaust lit as a kid (Jasper, Lisa, Daniel’s Story, Endless Steppe, Number the Stars, Diary of Anne Frank, Devil’s Arithmetic, and more). I know I watched Schindler’s List in middle school, but I don’t remember if seeing that movie was what led me to the books, or whether the timing was coincidental. At any rate, after my young adult binge, I…never really touched the topic since. It can be so exhausting to mentally put yourself in that place (thank god, of course, that I have the luxury of taking the break). 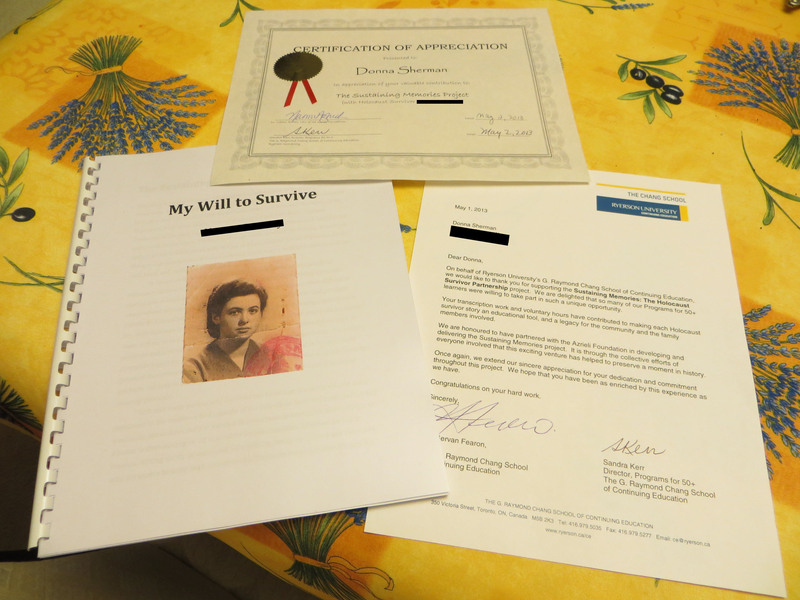 But last year, I began working at the Azrieli Foundation, which publishes the memoirs of Holocaust survivors who immigrated to Canada. At the time, they had published 20 English language stories, although I believe that number is now 21. I was given the entire library to read, and it took me about a month to work myself up to the challenge. What finally pushed me to start reading the books were the videos. The Foundation has also begun releasing short movies of survivors who have published memoirs with them. The movies feature a mix of book excerpts, interviews with the authors, and animation. I watched these videos during an afternoon of booth-manning, and not only did I finally feel ready to read the books, I also felt like I needed to. The videos were incredibly effective because once you hear them speak, and see them communicate, you (or at least I) feel the need to know them better. These people come from all over the world and have experienced anything from convents to concentration camps. I don’t feel comfortable rating these books – they’re personal and historical documents, not intentional works of literature, so I’m temporarily shelving my star system for now. However, I did want to review them, because I think they deserve to be read, thought about, and remembered. During my time working for the Azrieli Foundation, and partnering up with a Holocaust survivor to help write her memoirs, I have also, not surprisingly, been reading a lot of Holocaust literature. 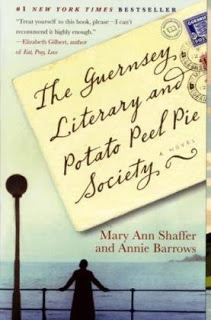 I previously reviewed some memoirs published by the organisation. Now I’d like to review a collection of works by Art Spiegelman, the first two of which are regarded as classics in both that genre, and the genre of graphic novels. Let’s start with the first volume. The story moves along briskly and is deceptively basic. It’s a simple black and white cartoon with minimal text. But a lot of stuff is packed into those words and those pictures, both explicit and inferred. I really liked that he tells the story in his father’s voice and accent – it makes you [the reader] feel like your own grandpa is telling it to you. I also liked that Spiegelman generally doesn’t put boxes around the drawings when they take place in his own [modern] times; only those that take place in the past are framed. Maus I and II were published in the 70s and 80s – examples of Meta before it was cool (seeing as how now, nothing is allowed to be published or aired on TV without copious internal referencing). I don’t read a lot of graphic novels (mostly just this and Alan Moore), and I enjoyed the way the format, by publishing the story chapter by chapter, allowed him to use subsequent chapters to make reference the process of writing, and to events occurring in response to those previous chapters, such as showing the work-in-progress to his dad. I found the parts with Vladek remembering his past and dealing with his present the most affecting – maybe because it’s a more personal and smaller sort of terror and destruction, maybe because marital strife, suicide, and depression are more relateable than the unimaginable horror of death camps, bunkers, and starvation, I don’t know. But I also always find it interesting to read the way children portray their parents in memoirs, especially if the relationship isn’t a traditionally happy and comfortable one (and Art and Vladek’s certainly wasn’t). 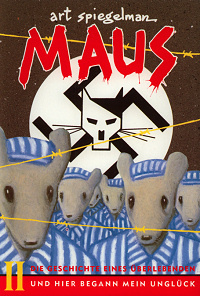 As good as Maus I was, Maus II was even better. When I worked in a textbook store, we sold thousands of copies of the first volume to high schoolers taking social studies or history or Jewish studies, but I can only remember selling one or two copies of the second volume, and I worked there for four summer rushes. It’s a pity. The second chapter’s musings on success, fear, and a visit to the shrink was incredibly affecting. “Strongest stuff yet. The work is maturing with him.” I wrote in my notes. I also found that this volume did a better job of mixing unexpected humour into the narrative during the depth of despair. Art Spiegelman is an artist and author, but he is also a scholar, and his hugely in-depth MetaMaus is somehow a making-of documentary in book form, a history of cartoon and graphic novel media, a collection of extended essays (philosophically talking about art, comics, familial relationships, the act of creating/artist’s process, war, the holocaust, religion, Judaism, survival), and, as he puts it, a build-it-yourself Maus tool kit (it includes a remarkable CD, which has almost every primary source he used to write the books – transcripts, photos, early drafts, obscure history papers, a bibliography – I still haven’t gone through all of it, but eventually I just needed to count this book as read). There’s a lot of stuff packed into this 300 page book. 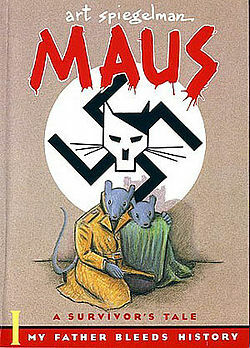 The book is dense, though, so if you’re a casual fan of Maus, I’m not sure I’d recommend it. On the other hand, it does have a lot to offer, even to people who have never read the book. For instance, it’s practically a crash course in the history of underground comics, which I knew next to nothing about (again, just Watchmen and V for Vendetta). Boy did I have a lot to say about this one. Although most of it is just quotes I liked, so instead of a traditional review, I’m just going to bullet point a list of comments and things that interested me. Because I can. Father is an extremely difficult, sympathetic man. No one would say the war was a good thing, but it brought out, as all events do, the good in some and the bad in others. 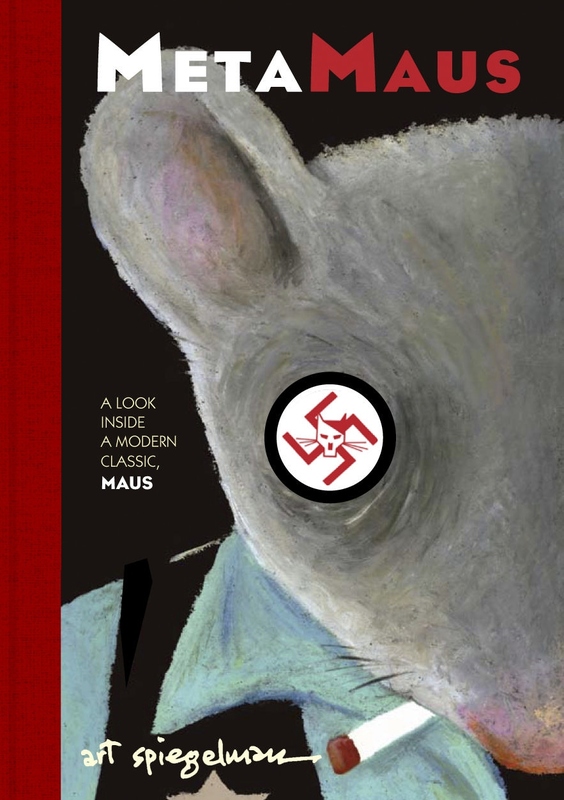 Even now, dad saw the cover: “what is it, a parody?” I’ve read Alan Moore and Gaiman, I know there are well-respected Batman comics/graphic novels, Walking Dead, etc, but did it all start with Maus? Because it’s written clearly and matter-of-factly in his father’s voice, I did’t imagine how much work must have gone into putting the story together. I like the concept of visual rhymes. Being honest about the material (which fits in with memory and storytelling) – brings up a lot of stuff about memory (the act itself, its historical importance, and the ability of comics, family relations, second generation). pg 77: rejection letters – Really fascinating, especially as a wannabee writer; think: this same thing later won a Pulitzer. pg 143: his style causes your eyes to move across the page; more elaborate styles really do make your eye stop and stare at each panel as its own separate things. An example is shown in the book of a version of a Maus page with much more intricate, detailed drawings. I found myself looking at each one like its own copper engraved plate. And the thought extends past what goes in each individual panel to how the panels interact with each other in a way that tells the story effectively and honestly, while also guiding your eye in a way that keeps you involved and easily readable. With enough variety so it doesn’t just looks like a grid. He looks at each page like a sentence and each panel as the words, or paragraph/sentence. pg 185: difference between comics and cartoons, and metaphors getting in the way of belief. pg 202: Understanding the limitations of oneself as an artist, but accepting that it doesn’t make you ‘less than’. It’s storytelling, and we get it out how we can. pg 203-204: discussion of art in museums, “comics weren’t trying to be paintings and failing at it; it’s drawing with a different purpose”; response to High/Low show at MOMA, placing comics and paintings in the same room, therefore implicitly comparing them.